Previously, I have written an article on display notification ProgressBar in head up notification while file uploading to the server using Retrofit. The solution work file while the app is foreground. 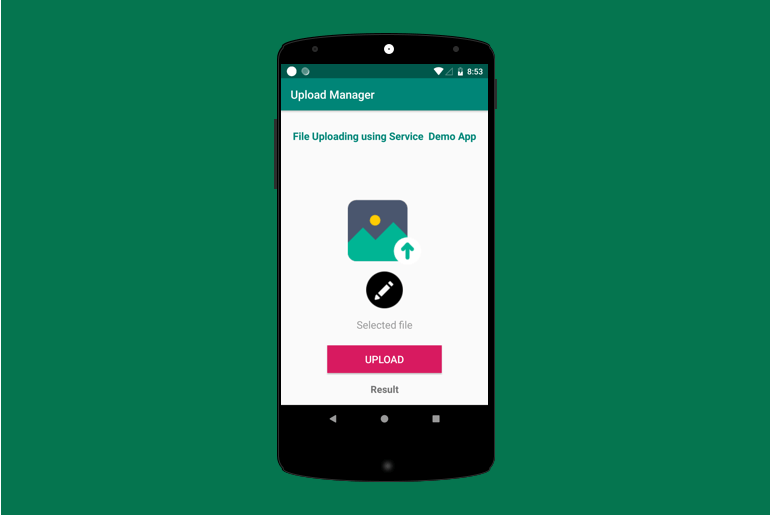 Now I have built a complete solution for file uploading with head up notification, No matter your app is background or foreground because that time we are using Service Enqueue for file uploading, In case of failure, the user can retry or cancel file upload without open the application. I will try to make a complete solution just like a phone download manager. In this article, We are using Retrofit, JobIntentService and Broadcast Receiver, Notification Service. So You have deep knowledge of each one. I have written articles for all major concepts. Read for capture file from Camera & Gallery using FileProvider. For Working with JobIntentService follow this artilce. Create a new project with min SDK 21. Finally, Enqueue the job to JobIntentService. Let move to android studio and create a new project with named FileUploadService. While creating a project set min SDK version 21 and choose EmptyActivity template. and defines some string constant in string.xml that string we are using in this project. * dependency to request the runtime permissions. Create a new subclass of JobIntentService in src folder named is FileUploadService. In this service we are majorly doing three things. let’s check above diagram. We are using two BroadcastReceiver one for listing file upload progress. Second for retry and cancel action button. Create a subclass of BroadcastReceiver named is FileProgressReceiver and override onReceive() methods. As per name suggesting. we receive file upload progress here and update the progress bar notification. So define below action and manages actions accordingly. Create a new class which extends BroadcastReceiver named is RetryJobReceiver. The service will be called this receiver when an error occurred in during file uploading such as network failure, internal server error etc. * Helper class to manage notification channels, and create notifications. * Get the notification manager. * Utility method as this helper works with it a lot. open activity xml and add some component such as ImageView for displaying selected and captured image, button for requesting camera and gallery intent. and One button for starting JobIntentService. Enqueue the Job and pass file path with Intent.